This is “In the Limelight,” our blog series that takes a closer look at some stunning canvas prints and the photographers behind them. Our “Limelight Questionnaire” gets to the who, what, when and why, while the photographers tell us in their own words what they want us to know about the shot. You’ll get information and inspiration In the Limelight! "Probably one of the most memorable images I've ever taken was this one of the Eiffel Tower. Ever since visiting Paris on my honeymoon I fell in love with the city and its iconic monuments. This image was a lot of fun to shoot. It’s pretty simple but stands out in my memory. We were sitting right below the Eiffel Tower. I had my 5D Mark II setup on a Joby GorillaPod looking practically straight up at 17mm. I used a 10-stop B+W filter and I believe I shot the image with a shutter speed of about 45 seconds. The moment was really memorable because a group of Japanese tourists were sitting right by me and thought my GorillaPod setup was the funniest thing they ever saw. They kept pointing and laughing. I had to stop a couple from walking over to my camera and putting their face in the frame! They didn't speak any English but we smiled and laughed together. This was the very first canvas I ever received from APC and still one of my very favorites. It hangs above my bed as a reminder of the wonderful city and memories made there." I fell into photography. I started out in high school working in photoshop and graphics and slowly merged into the photo making side of things. Working to create images that are dramatic and can be mounted on the wall is one of my favorite aspects of the art. What are your favorite things to shoot? I love to shoot a wide variety of things. For my personal time I love to shoot travel and landscapes. For work I like to shoot food, portraits, and interiors. Who inspires or influences you? I’m inspired by a lot of photographers and artists. I love looking at images in magazines and online. Some of the photographers I follow online are Joe McNally, Zack Arias, John Keatley, David Hobby, Moose Peterson, Craig Mitchelldyer, and many more. What has displaying your work in printed form meant to you? Why canvas? I love getting my work printed. Seeing my images on the wall really makes the process all worth it. How did you discover APC? 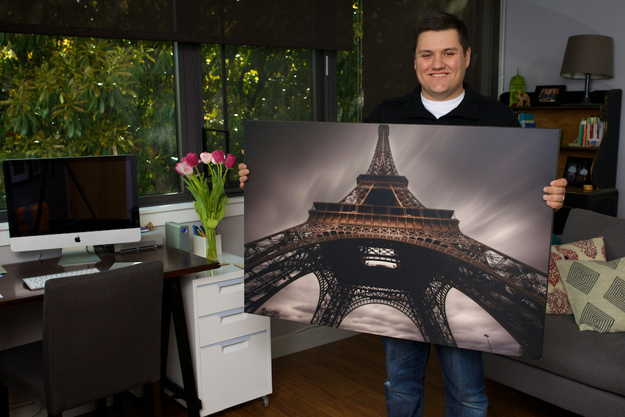 I heard about Artistic Photo Canvas online, I believe on one of the blogs by Kelby Media. I’ve since then gotten a number of canvases for both clients and myself. I have had nothing but amazing results and love working with APC! See more of Nick's work on his website and Instagram. You can also follow him on Twitter.